Hiya! Welcome all to my profile! Well, not really a lot can be say here, I mostly mod and map for the GoldSource engine, though I do mod other stuff here as well. Anyway, hope you enjoy your visit! I have no idea where to put this, might as well just place it here. 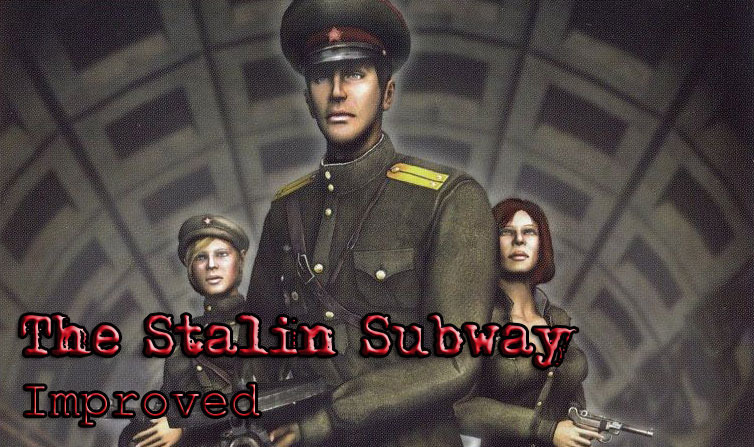 Some of you guys may have played a game named The Stalin Subway. - The average sound effects of the weapons. - The horrid translation on the loading screens/normal gameplay. I am unable to fix the famous "Black Textures" or the "Audiere.dll" problems, i'm guessing they're the developers job rather than mine. I could attempt to fix the voice acting, and try to reinterpret the subtitles so that some stuff would makes more sense (With the cost of "not a true translation", but a reinterpretation of what is said. ), but i need the Russian voice acting, which i don't have because i'm using the disk version rather than the Steam version. Installation is simple, just overwrite the folders in the .rar to the installation folder. 2. Go to the "The Stalin Subway" folder. 3. Extract the folders (txt, sounds, music, textures) to the installation folder where you installed The Stalin Subway to, and click OK when asked to overwrite. 4. Use the icon incase you decide to make a shortcut. - The crosshair in TSS1 is replaced, i dislike it since it was really huge, and blocks view during long range combat, TSS2's crosshair is not-changed because of the opposite, more close range stuff. - TSS2's difficulty was changed from Easy, Normal, Hard. Seriously, playing TSS2 on actual Normal is going to tear your hair out by the end of the game, Easy was really the way to go on TSS2. - The additional music that replaced the godawful (IMO) dubstep-ish music in TSS1 is made by the guys from the Ispitatel 4 mod for Half-Life. From the credits i think it's "Alexander Grig", kudos to him. - TSS2 music is unaltered for personal reason, i don't know, i just liked the music, your opinions may vary. I think the reason i made these is because i was just bored and decided to change the ear-turd sounds of the originals. The game itself is kinda stalin' subpar. Never thought someone would actually enjoy it. EDIT : Woah, someone actually made a walkthrough of the game using my mod, now i feel weird all of the sudden.